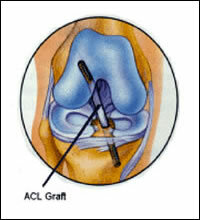 ACL Reconstruction - Los Angeles, CA | C. Thomas Vangsness, Jr., M.D. C. Thomas Vangsness, Jr., M.D. Ligaments are pieces of fibrous tissue that connect bone to bone and provide stability to your joints. 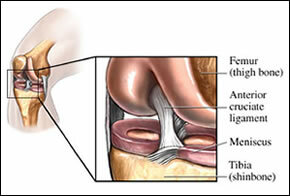 The Anterior Cruciate Ligament (ACL) is one of the most important ligaments in your knee. It is also one of the most commonly injured. The ACL runs from the back of your femur (upper leg bone) diagonally forward to your tibia (lower leg bone, see fig 1). Its primary function is stability, by preventing forward motion and rotation of the tibia.Athletes usually tear their ACL while performing a stopping and twisting movement while coming to a sudden stop after forward motion. Another common way the ACL is torn is when the knee is forced into hyperextension. When the ACL tears the knee may shift and rotate, causing injury to other structures in the knee, most commonly the medial (inner) meniscus. The knee joint may swell quickly. Pain and inability to bear weight immediately following the injury. A general feeling of instability following the injury. Decreased range of motion due to pain and swelling. Once the ACL is torn, it will not heal on its own. The symptoms of instability and episodes of the knee “giving way” may continue until the ligament is replaced with surgery by using your own tissue or donor tissue from a tissue bank (allograft). I make the diagnosis of an ACL tear based on the patient’s history and physical examination. If the patient is experiencing the signs and symptoms noted above and the physical exam shows that the knee is unstable, that may be enough to diagnose an ACL tear. I perform a ligament test called a “Lachman test” (fig 2) where I manually pull the tibia forward to check integrity of the ACL. These tests generally do not hurt, but give me valuable clinical information about the structural integrity of your ACL when compared to the uninvolved side.Once the diagnosis has been confirmed, I will most likely recommend a reconstruction of the ligament. Even if you are not an athlete, a knee without an ACL is more unstable and prone to developing other injuries, such as meniscus or articular cartilage damage. Both of these injured structures can give you some pain and lead to early arthritis. Athletes must have the ACL reconstructed in order to continue to play turning, stopping, twisting sports competitively. After the physical exam, I may want to order an MRI to confirm the diagnosis or determine if other structures were injured when the ACL was ruptured. Other tests that may be performed include KT-2000 arthrometer testing. 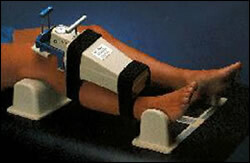 This machine is attached to the knee and measures the distance the tibia moves forward and therefore can help diagnose an ACL tear (see fig 3). This test usually does not hurt either, unless the injury just happened and the joint is very swollen and sensitive. Regain full range of motion of the knee joint (ability to bend and straighten the knee all the way). Increase strength of the muscles surrounding the knee (hamstrings and quadriceps muscles). If your knee is not symptomatic, that is there are no episodes of buckling or instability, then you may choose to not have surgery. The muscles around the joint can help give the knee some stability for activities of daily living. However, this is not usually recommended. The BTB graft can come from the central third of your patellar tendon (autograft) or a tissue bank donor (allograft). There are different advantages to each. The autograft uses your own tissue, but the surgeon must cut into your bone to harvest the graft. This can lead to more post-operative pain and extended healing time as the body replaces the area with scar tissue. The allograft is harvested from a donor or cadaver and is screened for diseases so that the chance of infection is almost non-existent. The allograft has the advantage of the surgeon only having to drill the holes and place the graft in order to do the repair. This means your body just has to work on healing the new ACL instead of the new ACL and a graft site, offering quicker return to activity in most cases.I perform ACL reconstructions by removing the old ACL, drilling a hole through the tibia and femur and then positioning the ACL graft where the old ACL used to be. The graft is secured using screws that hold it in place while the bone from the graft heals to the tunnels in the leg bones. The procedure is straight forward, and in most cases, you will be able to go home the same day (outpatient procedure). In addition to the common BTB graft, your hamstring tendons or allograft (tissue from a registered tissue bank) tendons can be used. After the surgery, the knee will be kept straight (in full extension) using a brace. Soon after the stitches are removed a week after surgery, your doctor will begin physical therapy. Adhering to your physical therapy regimen is perhaps the most important part in having a successful outcome to your surgery. Simple goals after surgery include getting the knee straight (full extension) and working on knee bending (flexion) over the next few weeks. Stationary cycling is a good simple exercise. Jogging can begin at 3 months after surgery with return to sports at 6-9 months after surgery. Your physical therapist and doctor will emphasize regaining strength and range of motion during the rehabilitation process.The overall goal of ACL surgery is to stabilize the knee from giving way episodes. Complete pain relief cannot be guaranteed as 50% of time there can be an associated meniscus tear and 20-25% of the time you can have some associated damage to the articular cartilage. Click Here to view Frequently Asked Questions for ACL Reconstruction.